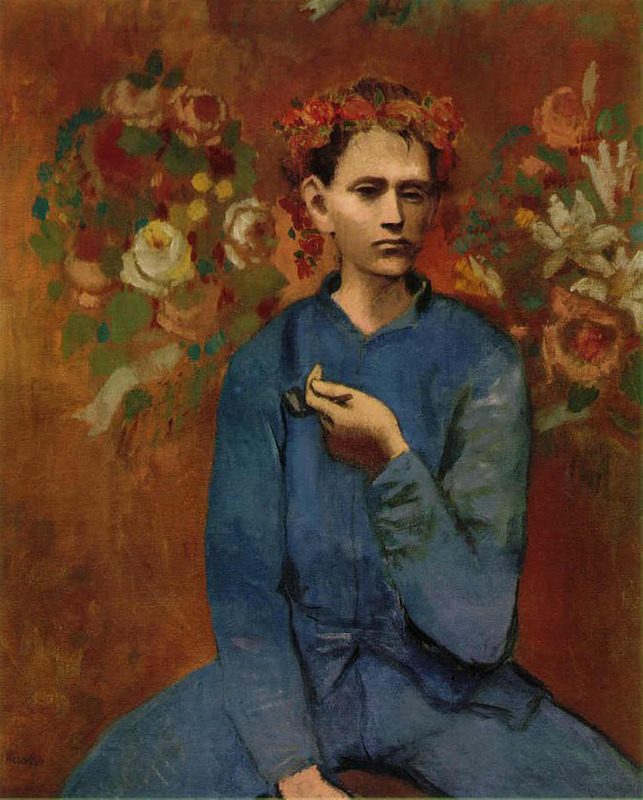 Boy with pipe was painted in 1905, when Picasso was 24 and lived in Montmartre, a neighborhood of the French capital city. As a snob info, we can say that, this year, 1905, is a transition year for the painter, due to the fact that his palette was changing from the cold and depressive colors of the blue period (1901-1904) into the warm and joyful colors of the rose period (1904-1906). This work is also known for being one of the most expensive paintings that have ever been sold in history. In 2004, an anonymous buyer paid over 104 million dollars for it. The painting shows a boy with an indifferent look, although a little twisted, with a pipe in his hand; and he is portrayed with a crown of flowers and a background with a floral pattern. This boy is petit Louis, little Louis, who was 10 and wondered around Picasso’ study to see how he worked. Many times, Louis spent the whole day in there and, according to the words of the artist himself, he enjoyed it very much. So Picasso took him as a model and began with studies on how to portrait him. He made sketches with him standing, sitting and against a wall. In these sketches, the only thing that seemed to matter the painter was the pipe. He then began with part of the work; he stopped for a month, and finally ended it. The crown of flowers, as well as the pipe, seem to disconcert art critics. They think that the canvas tries to express the ambivalence between the feminine and the masculine, but this, to me, seems… wrong. If Picasso would have really wanted to express this ambiguity, he would have done it more effectively. You know what I think? That Pablo, my personal friend, wanted to portrait little Louis as an angel. On what grounds? Notice the background. Yes, the floral background. The arrangement of the flowers and the leaves in two big blocks; and the location of those blocks, as coming out from the boy’ shoulder blades, make me think of wings. Floral wings. And the crown also feels like an angelic symbol, although I cannot base why. It simply does. That’s why the painting does not express a gender ambiguity to me but, instead, I feel it like an expression of the ambivalence between what William Blake calls innocence vs experience. The floral motifs on little Louis seem to belong to a young, pure and naive angel; but the pipe in his hand and the twisted look in his face, seem to be the ones of a person who has walked a long way and that had experienced much. Guilty angel. ~ by Álvaro Mazzino on July 14, 2010.
the most among these kind of. smartphones, i – Phones and i – Pods and even i – Pads and tablets in both touch screen and handheld mode. Check out the best HTC Wildfire deals and HTC Desire HD deals. lunch break or is on the way to an appointment, a short stop for a little entertainment is a welcome activity. family. After 4 to 5 months of reporting “bam” you have credit scores. The list below represents some of the most common benefits the buyers like. each year, it may be helpful to have a small amount of med-pay coverage to ensure that additional therapy visits will not have to be paid out-of-pocket. Having said that, password protected PDF’s incorporated with your online fax solution changes that through providing a solution for small to large end users. Sources, however, feel that there is more than meets the eye. from friends or relatives is almost never a good idea). they need to but this should not be. If hand crafted goods appeal to you then the online craft sites may be able to provide you with your ideal starfish. I know this web page gives quality dependent articles or reviews and additional stuff, is there any other site which presents such things in quality? Hi, always i used to check webpage posts here in the early hours in the break of day, because i like to find out more and more. This entry was posted on July 14, 2010 at 16:48 and is filed under Cubism.You can follow any responses to this entry through the RSS 2.0 feed.You can leave a response, or trackback from your own site.